Last night, Nashvillest headed out to see the Nashville Rollergirls take on the B-Funk All Stars at the Southern Hospital-ity roller derby event featuring DJ Fat Andy. 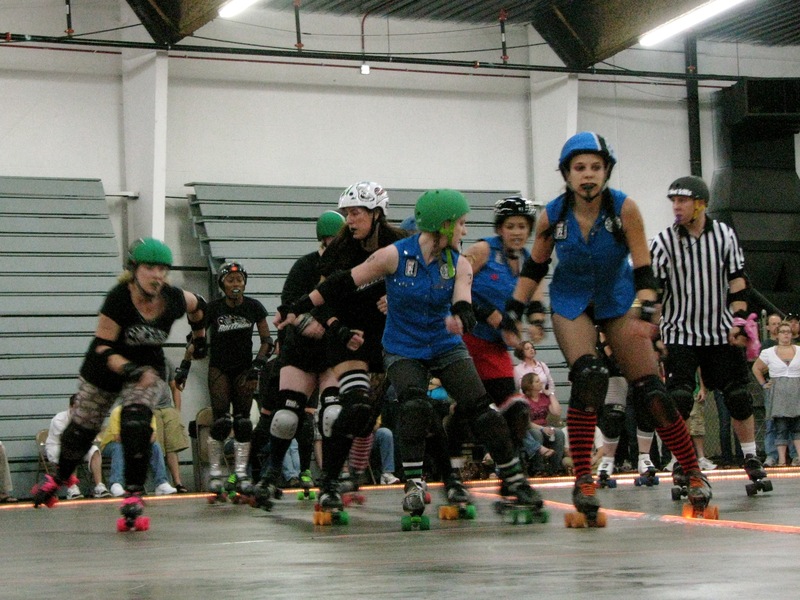 For the uninitiated, roller derby is kind of a rough sport where two teams race around a track and try to lap each other as many times as they can. In short- plenty of limbs flying, bodies slamming, skaters careening off the track, and painful looking pile-ups. And it’s a lot of fun to watch, as long as you stay out of the way. Like most of the matches, last night’s went down at the Tennessee State Fairgrounds just south of downtown. It was our first time seeing it live, and we had no idea it was such a big deal. The house was packed out, though, and there were even cheerleaders (well, NRG calls them jeerleaders) who kept the crowd pumped and put on a fun show during the two intermissions. We camped out in the bleachers, but plenty of people stood around the ring or opted for the “suicide seats,” which we came to realize meant you could end up with a roller girl (or three) crashing into you at any given moment. The entire thing lasted about an hour and a half, and Nashville came out on top 149-65 to break their three-game losing streak. Last month, the Nashville Rollergirls became the first team in Tennessee to be accepted into the Women’s Flat Track Derby Association (national organization that oversees the sport). They seem to have hit local celebrity status in the past few months, hosting an art show at Jackson’s Bar & Bistro on W ednesday night and even appearing in the Nashville Scene’s summer guide that came out this week. Check out their website for an up-to-date schedule, and don’t miss out on one of Nashville’s most talked-about summer happenings. Or, if you’re tired of watching and you think you have what it takes to skate with the best of them, contact Slammylou Harris or LeeAnn Crimes at [email protected].